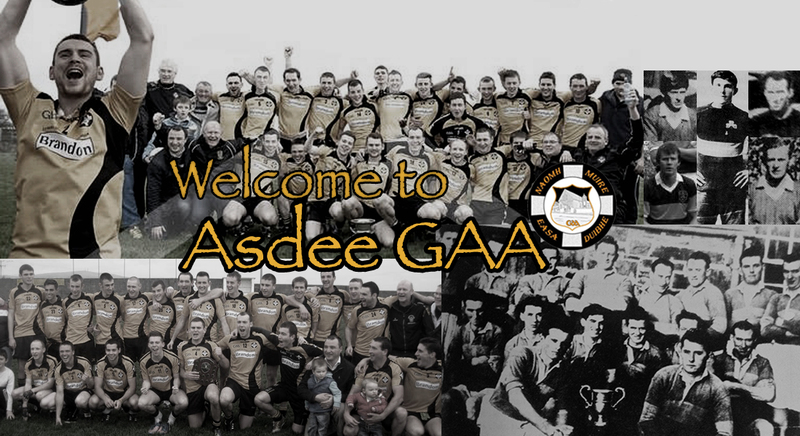 Asdee made their first appearance in a County Final in thirteen years on a day when conditions were ideal for football at Stack Park, Ballybunion. A hotly anticipated local derby fully lived up to its billing as both sides played a very open fast paced game of football which contributed to a very entertaining game. Balllylongford struck first blood with a superb solo goal from County panellist David Culhane in the 2nd minute of the match and followed it up with two points from Kieran Mulvihill and Jer Tydings in the 4th and 5th minutes. Eoin Kennedy got Asdee on the scoreboard with a free a minute later before the men in Blue and White added another point to leave the score 1-03 to 0-01 in favour of Ballylongford. At this stage it looked like the game was beggining to slip away from Asdee who came in to this game as big underdogs. However, the team rallied and produced a stirring fight back led by Eoin Kennedy, Mike Breen and Michael Tydings who between them contributed all of Asdees total of 1-12 on the day. Credit must also go to the entire Asdee defence for doing an excellent job on Ballylongfords highly rated forwards. Mike Breen raised the white flag in the 10th minute before Eoin Kennedy added a point to leave Asdee trailing 1-03 to 0-03 before Mike Tydings got on the end of a superb team move to score the point of the game. John Doran and Padraig Ruddle were outstanding all day at midfield ably assisted by Darren Russell and Kieran Kelly who both picked up several breaking balls. This gave Mike Breen and Eoin Kennedy the platform to level the match with points late in the first half.The half-time scoreline read Asdee 0-06 Ballylongford 1-03. Ballylongford came out of the blocks flying in the second half and scored two points in quick succession. A first minute free from Jer Tydings was followed by an effort from Kieran Mulvihill a minute later. Eoin Kennedy responded with a 6th minute free before Mike Tydings scored his second of the day on the 8th minute to bring Asdee within a point at 0-07 to 1-05. However, Asdee then hit a purple patch and scored four unanswered points all coming from the boot of Eoin Kennedy in the 15th, 17th, 19th and 20th minutes to leave the score Asdee 0-11 Bally 1-06. Ballylongford showed great fight to once more reduce it to a one point game with points from Joe McCarthy and Jer Tydings both in the 27th minute to set up a nervy finish for the men in Black and Amber. Ballylongford attacked once more to find a levelling point but lost possession and Asdee swiftly countered with Eoin Kennedy eventually getting on the ball within twenty yards of the Bally goal. Under heavy pressure he managed to get his shot away which beat Paudie Moroney in the Ballylongford goal to give Asdee a four point cushion. Balllylongford had time for one last attack and went for the aerial route into the square. However, the Asdee backs who were superb all day managed to clear for a final time before the referee blew the full-time whistle. For the first time since 1988 Asdee are County Champions. Commiserations to Ballylonford who played some lovely football and made a huge contribution to what was a great match for spectators to enjoy. To a man Asdee produced a brilliant team performance on what was one of the clubs greatest days since being founded in 1986. Paudie Moroney, Kenneth Tydings, Eamon McElligott, Steven Mulvihill, Liam McElligott, Daniel Lane, Mossy Kenrick, Kenneth Sheehy 0-1 ,David Culhane 1-0,Kieran Mulvihill 0-2,Joe McCarthy.0-1,Jason Deegan,Liam MCCarthy, Jeremiah Tydings0-4, Matt Connor. Subs used Padraig O Neill. Brendan Bambury, Ray Sullivan.